Today Transparent Man educates visitors to the Barbara Woodward Lips Patient Education Center in the Siebens Building at Mayo Clinic's Rochester campus. Debuted at the 1933 Chicago World's Fair, Transparent Man was a breakthrough in educational technology. Today the exhibit lives on, greeting visitors as they enter the Patient Education Center at Mayo Clinic's Rochester campus. He's an 85-year-old performer who still attracts an audience. Transparent Man is an iconic exhibit near the entrance to the Barbara Woodward Lips Patient Education Center in the subway level of the Siebens Building at Mayo Clinic's Rochester campus. He came to Mayo Clinic via Dresden, Germany, by way of the 1933 Chicago World's Fair. 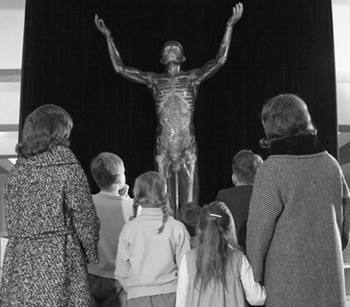 Children and adults study Transparent Man in the Mayo Medical Museum in 1964. "I know of no other medical institution in the United States that would be more appropriate to exhibit in Chicago the 'Transparent Man' than the Mayo Clinic," Eben Carey, M.D., wrote to William J. Mayo, M.D. Dr. Carey was an executive of the World's Fair, officially known as the "International Exhibition, A Century of Progress." Dr. Mayo and the Mayo Clinic Board of Governors agreed. Mayo Clinic paid $10,000 (about $192,000 today) for construction of what then was a breakthrough in educational technology: a life-size, see-through replica of the human body. Transparent Man was the first model of its kind to be displayed in the U.S.
Artisans at the Deutsches Hygiene Museum worked for 18 months to construct the model. Its skin is made of cellon, a transparent, durable and nonflammable material that was a technical marvel of the time. The skeleton, along with the blood, vascular, nervous, digestive, urinary and endocrine systems, are all visible. Built in the early days of sound engineering ("talking pictures" had recently premiered in Hollywood), the model delivered a 10-minute recorded audio lecture. Documents in the Mayo Clinic Archive show the script underwent rigorous editorial review, as subject matter specialists sought to achieve medical accuracy in a narrative that was interesting for a general audience. The model was a focal point of the World's Fair, which attracted an estimated 39 million visitors. "The object of all health education is to change the conduct of individual men, women and children by teaching them to care for their bodies well." — Charles Mayo, M.D. Even in the depths of the Great Depression, Mayo Clinic made the commitment to sponsor Transparent Man as an educational service to the public. It was especially important to the clinic's leaders that visitors be inspired by the wonders of the human body and the opportunities for careers in medical science. Charles Mayo, M.D., wrote: "The object of all health education is to change the conduct of individual men, women and children by teaching them to care for their bodies well." Mayo Clinic invited students at Rochester High School to submit questions and suggestions for improving the model's narration. Following the World's Fair, Transparent Man made the final leg of his journey to Rochester, but he has updated his address on the Mayo Clinic campus several times since then. Transparent Man went on exhibit in the Mayo Museum of Medicine and Hygiene, later called the Mayo Medical Museum. Its first location was in the former Central School Building, which stood where the Mayo Building is located now. Transparent Man at the Chicago World's Fair in 1933. 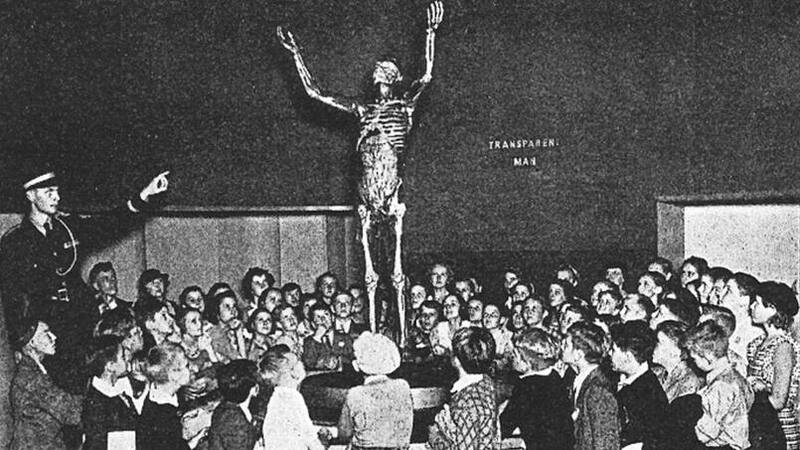 The caption from the exhibit program reads: "Staff Demonstrator giving a popular lecture on anatomy and physiology to fifth and sixth grades school children of Chicago. Three hundred thousand Chicago school children came to the Hall of Science in small groups on conducted tours during the last thirty days of the Exposition." In the early 1950s, the museum moved to temporary quarters near the site of today's Eisenberg Building at Mayo Clinic Hospital — Rochester, Methodist Campus. A decade later, the museum opened in the Damon Parkade, a multiuse facility previously on the site of today's Gonda Building. Since 1989, Transparent Man has been at home in the Siebens Building. With the push of a button, the recorded voice still speaks, and colored lights illuminate the organs being described. Anthony Cook in Patient Education says staff periodically dust the exhibit, but, "I’m not aware of any regular maintenance done to care for the Transparent Man. We have many patients who stop by to take photos of him and with him." 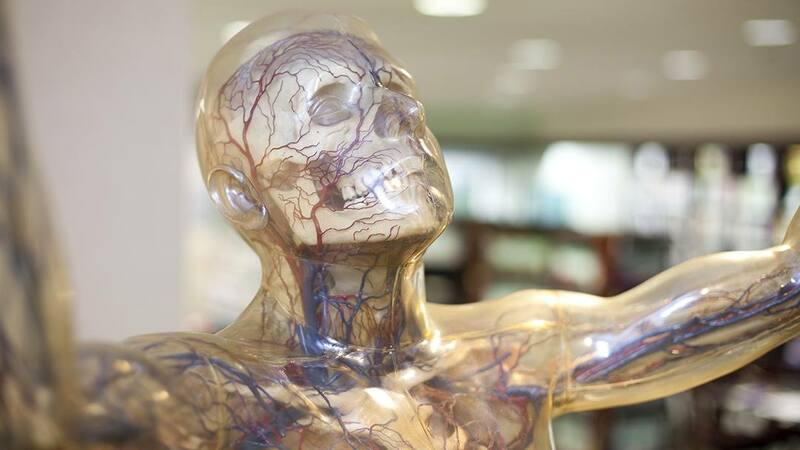 Educational technology has evolved since 1933, but Transparent Man's message remains true for 21st-century visitors: "Health is something that depends upon you and your environment." Explore the Barbara Woodward Lips Patient Education Center.